A file with the TORRENT file extension is a BitTorrent Data file that contains information about how files should be accessed through the BitTorrent P2P network. Much like a URL, TORRENT files simply point to another area on the internet where the file is at and use that location to retrieve the data. Also like a URL, this means that if the location of the file is not active on the internet, the data can't be downloaded. Things like file names, locations, and sizes are included in a TORRENT file, but not the actual data itself. A torrent program is required to download the digital files referenced from within the TORRENT file. While there are many places to find TORRENT files, most are used to spread copyrighted movies, music, and games, which is considered illegal in many countries. Fortunately, there are also free and absolutely legal alternatives where you can watch TV shows online, stream movies online, download music, find audiobooks, and download PC games. Take great care when downloading software, music, or anything else through torrents. Since you're most likely taking files from people you don't know, you always run the risk of there being malware included with the data. It's important to have an antivirus program installed to catch anything potentially dangerous. TORRENT files are opened in a torrent client like uTorrent or Vuze, or even online through a website like Filestream, Seedr, or Put.io. If you're on an Android device, you can use the Flud or uTorrent app. Online torrent sites like Filestream and ZBIGZ download the torrent data for you on their own servers and then give you the files to download directly through your web browser like you would a normal, non-torrent file. Downloading torrents online with Put.io or another web-based torrent client, is helpful if your ISP or institution blocks or limits BitTorrent traffic. This works because from the service provider's point of view, the downloads aren't any different than regular HTTP traffic. The contents, or instructions, of TORRENT files, can sometimes be viewed using a text editor. However, even if you can read through the TORRENT file as a text file, there's nothing in there that you can download or realistically use/read — you have to use a torrent client to actually get the files. A free file converter is the method of choice for converting most file types, like DOCX, MP4, etc., but TORRENT files are an exception. Since a TORRENT file's purpose is for holding instructions and not for storing files themselves, the only reason to convert a TORRENT file is to save it under a new format that can still utilize those instructions. For example, you're able to convert a TORRENT file to a magnet link (similar to .TORRENT) with the Torrent > > Magnet website. Something you most certainly cannot do with TORRENT files converts them to "regular" file types like MP4, PDF, ZIP, MP3, EXE, MKV, etc. Again, TORRENT files are only instructions for downloading these types of files, not the files themselves, which means no amount of converting of any sort could ever pull these types of files out of a TORRENT file. For example, while a TORRENT file can describe to a torrent client how to download, say, the Ubuntu operating system, simply changing or converting the .TORRENT file itself will not get you that OS, or anything really. You instead would need to download the .TORRENT file from the Ubuntu website and use it with a torrent client, which would then download the ISO file that makes up the operating system — it's that ISO file that the TORRENT file explains to the torrent client how to download. However, at this point, after the ISO has been downloaded, you can convert the ISO file like you would any other file by using a free file converter. It doesn't matter if the TORRENT file was used to download PNG images or MP3 audio files — you can then use an image converter or audio converter to convert them to JPG or WAV files, for example. 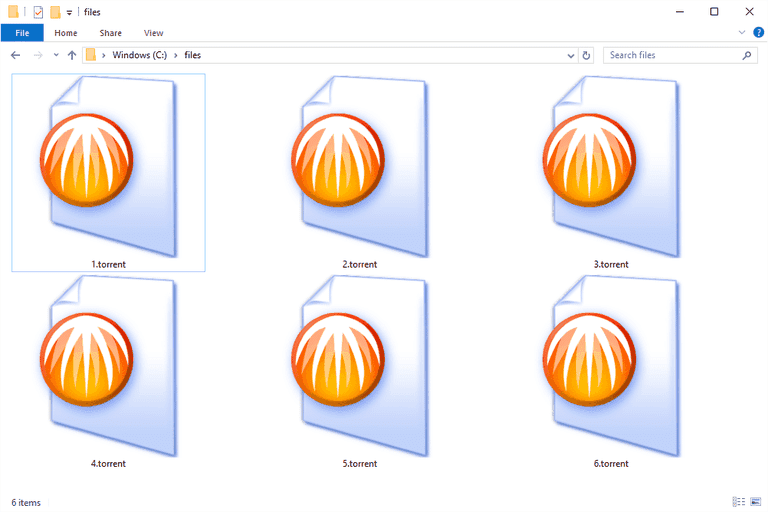 Some file extensions looks similar to others, but that doesn't mean that the files themselves are related or that they can be used by the same programs. For example, TORRENT and TOR look alike but the latter is a file extension used for Star Wars: The Old Republic asset files that holds game data like weapons and music. The Star Wars: The Old Republic game is needed in order to make use of TOR files. TRN is another example that could be confused for a TORRENT file even though it's actually used for SQL Server Transaction Log Backup files and opened with Microsoft SQL Server. What's a BDMV File and How Do You Open One? What's a Text File & How Do You Open One? What's a BZ2 File and How Do You Open One? What's an XP3 File and How Do You Open One? What's an OGG File and How Do You Open One?